Lucideon has introduced an apprenticeship program to create a new generation of talent committed to the long-term success of the company. 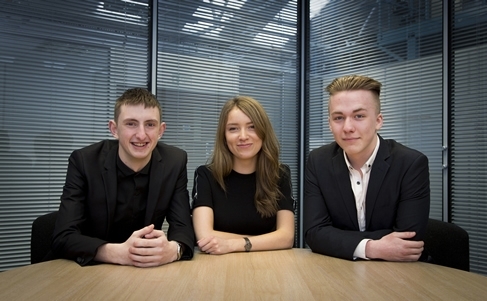 Pictured, Niall Cronin (left), Nena Lawrence (center), and Liam Seprini (right), on Business Support Apprenticeships with Lucideon. The global business, which has its headquarters in Stoke-on-Trent, has recruited its first cohort of five apprentices to work in the laboratories, as well as in marketing and administration roles. Over the next five years Lucideon is looking to bring in around 20 new trainees, offering a structured, high quality program which, it believes, will build on the increasing reputation and stature of apprenticeships. The first recruits are undertaking programs in association with Macclesfield College and Newcastle-under-Lyme College. Mark Smith, HR manager at Lucideon, said: “We have created an apprenticeship program to offer an alternative route into professional roles within the business from the ‘traditional’ graduate recruitment. “It’s early days, but we hope it will create a cadre of employees whose careers will develop at a steadier pace than those of most graduates. Lucideon develops world-leading technologies and innovation and operates at the forefront of the materials industry globally. Its work requires top-flight expertise in science, technology and engineering – which is reflected in the high graduate employment ratio. More than 55 per cent of its employees hold a university degree and 20 members of staff have PhDs. Mr Smith added: “The recruitment of graduates will continue to be crucial to our business. “They offer the ability to contribute quickly, applying the knowledge and skills acquired at university. “However, we believe that apprentices offer longer-term stability and their involvement in the business will be a cornerstone of our focus on sustained growth. “We are introducing a training program which will enable apprentices to have a clear development path, blending study and practical experience. “Our apprentices who, for a variety of reasons prefer not to take the university route, can still gain qualifications enabling them eventually to reach senior positions in the business. Lucideon is a leading provider of materials development, testing and assurance to a range of sectors including ceramic, construction, healthcare and power generation. As well as its headquarters in Stoke-on-Trent, the company has offices and approved laboratories around the world, including both North and South Carolina, New York State and Cambridge in the UK. Lucideon originated from the Stoke-based British Ceramics Research Association, established in 1948 in the heartland of the ceramics industry. Today, while the ceramics industry is still a key part of the business, it has taken ceramics technology into many new and innovative areas, including working with orthopaedic implant manufacturers and other high technology businesses. The company is also a hub for the development of construction materials and technologies.